Costa Rica’s Manuel Antonio National Park is situated about 3 hours south of San Jose, near the towns of Jaco and Quepos. 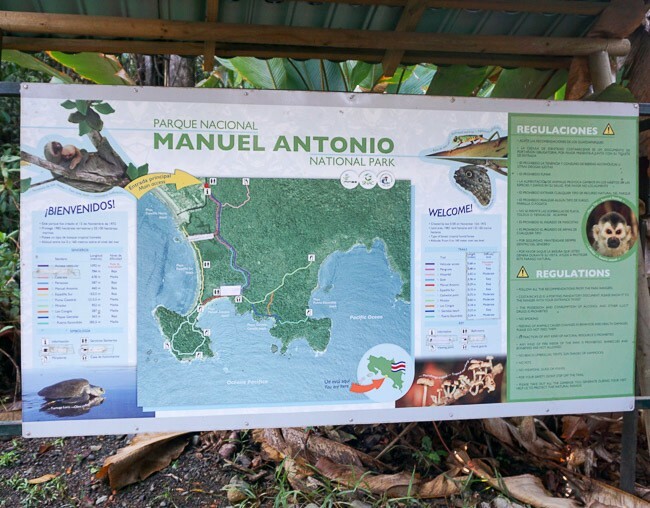 The Manuel Antonio area just outside the park has everything visitors need for a successful trip, from lodging and restaurants to markets and tour operators. 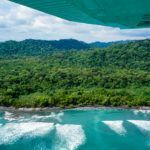 What makes Manuel Antonio special, though, are its wildlife, beaches, and a range of adventurous activities for all visitors. On both my trips to Costa Rica, I dedicated a few days to enjoying this Pacific Coastline region. 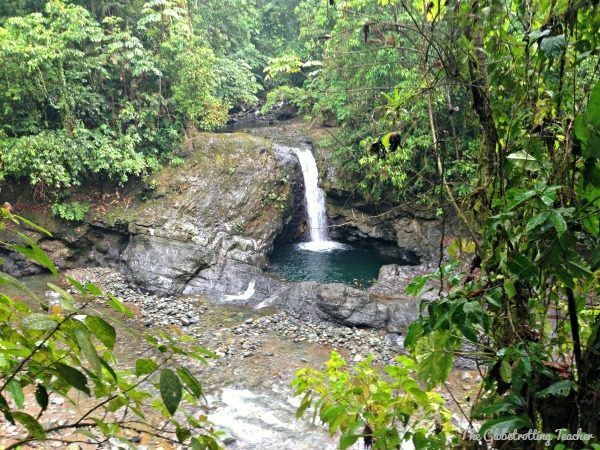 Yes, I loved hiking to the Rio Celeste in Tenorio National Park in the northern Guanacaste province. I can’t seem to get the stunning Osa Peninsula and beautifully wild Corcovado National Park out of my head. But, if it’s your first time in Costa Rica (and even if it’s your 2nd! ), it’s well-worth your time and effort to begin your travels in Manuel Antonio and the surrounding area. 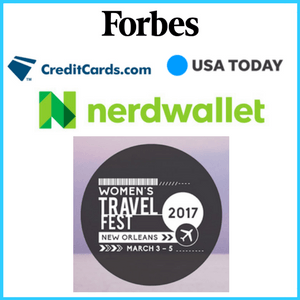 Pin this post to you Pinterest travel board! The views from the mountains are sweeping and set against the greens of the tropical rain forest. 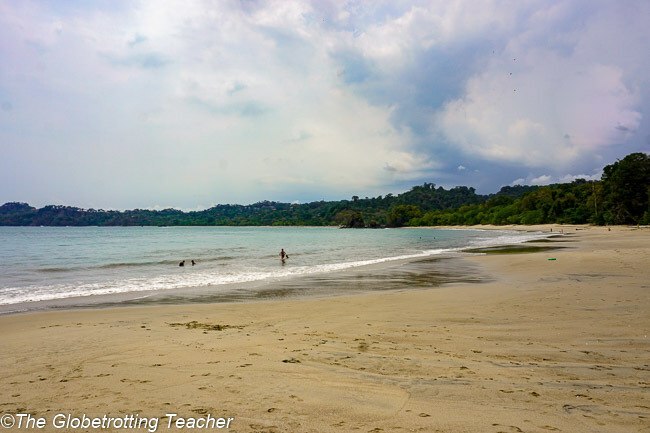 The beaches are contained within Manuel Antonio National Park, so there are no hotels or resorts along the beach. 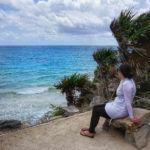 What you get is an unspoiled shoreline and a rugged, wild tropical forest at the sand’s edge perfect for exploring, sunbathing, swimming, and picnicking. Monkeys screeching and birds chattering mix with the rolling waves for a deserted-tropical-island-feel. The white-faced monkeys, however, will waste no opportunity to expertly maneuver through the trees and loot your backpack for a snack. Yes, they know how to work a zipper! 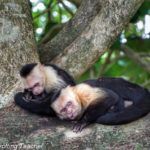 To avoid these little thieves, as well as the larger groups of people, settle into a comfy spot on Playa Espadilla instead of the main Manuel Antonio Beach. It’s less likely your sandwich will be swiped and the beach is far less crowded. You’ll also be at the trailhead for Punta Cathedral where you can hike on your own and take in the Pacific Ocean vistas. Once outside the National Park, many visitors stay at the hotels or Airbnb rentals dotting the hillside, perched high up overlooking the park and the Pacific Ocean. I’ve done both and had fantastic stays. You can view my hotel here. 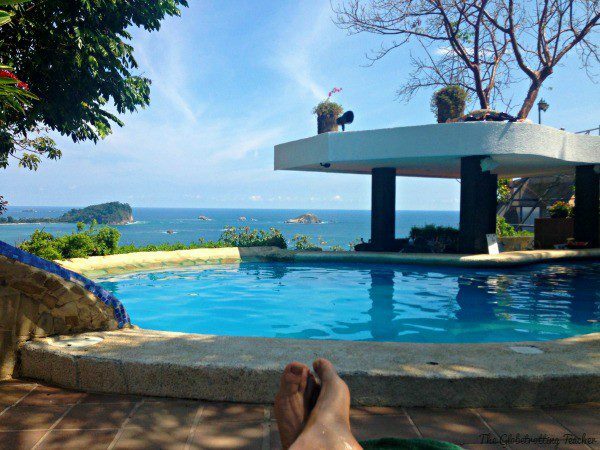 It’s hard to top a swim-up pool bar, overlooking Manuel Antonio and the Pacific Ocean! Manuel Antonio National Park is just 3 square miles, yet it is home to over 100 different mammal species and nearly 200 tropical bird species. Animals in Costa Rica are as diverse as you can imagine. But, of course, the monkeys and the sloths are the most popular! 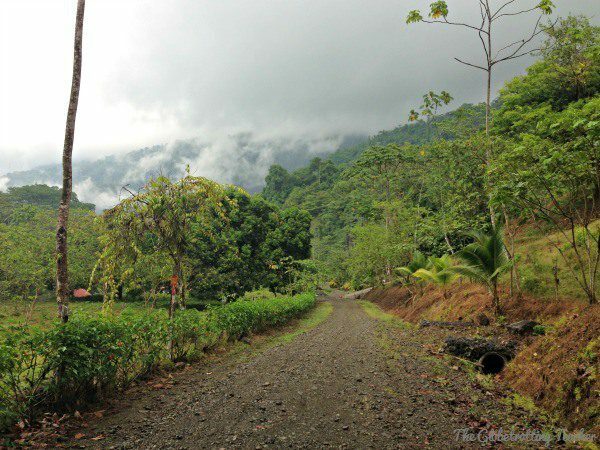 Traveling to Costa Rica soon? 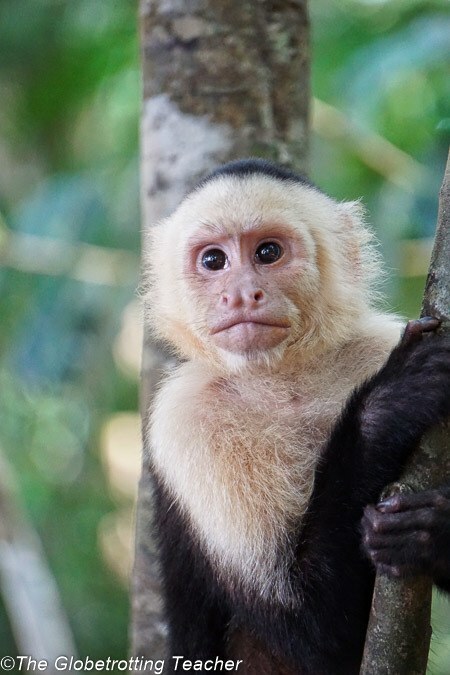 Manuel Antonio National Park is home to 3 different types of monkeys, the capuchin monkey, the squirrel monkey, and the howler monkey. We were lucky enough to see all of them. They swing through the trees as quick as a flash, though, so be ready with your camera in hand! I highly recommend hiring a guide. Yes, it’s easy to see some of the more obvious animals or to spot a guide with a group intently staring into the trees and shadow along with them. 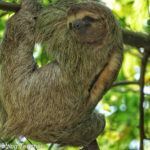 But, an expert guide will take you through Manuel Antonio National Park and spot creatures of all shapes and sizes that are doing their best to remain camouflaged. 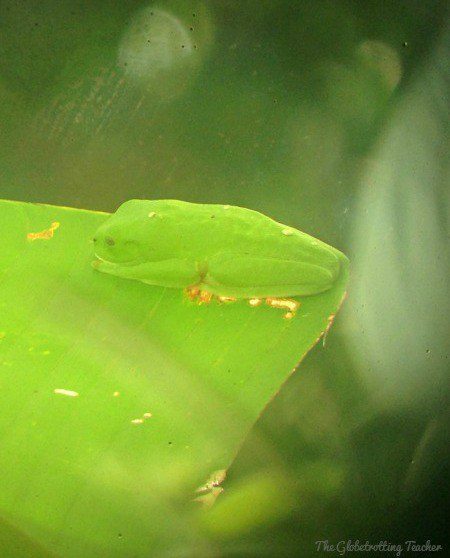 Do you see the tree frog sleeping on the leaf? Our guide, Johan, was so passionate about the animals, insects, and plants in the park and it made our small group of 5 even more engaged and knowledgeable. With his telescopic lens, you’ll be able to see even the farthest animals. When necessary, he used photos on his iPad to compare species and teach about the animals’ characteristics and habits. Most incredibly, though, Johan seemed to have X-Ray vision! 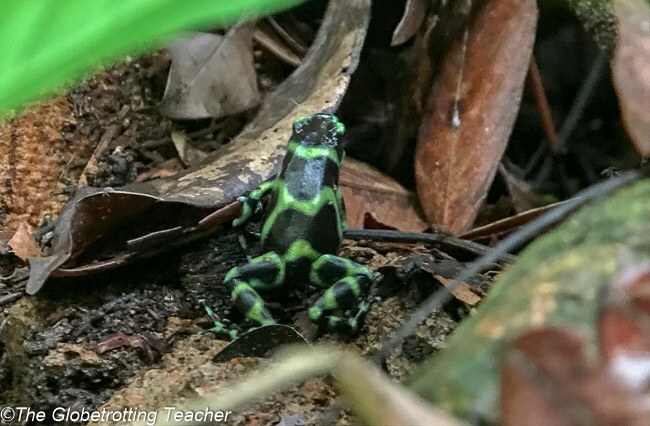 Where untrained eyes see only trees and leaves, he found a poisonous dart frog the size of your thumb. Instead of walking past trees only seeing the big picture, we saw tiny, skittish lizards doing their best to blend into the surrounding trees. He deciphered animal sounds and used his ears to guide us straight to a toucan hidden among the canopy leaves. Don’t risk an uninterested guide waiting just outside the park to be hired by visitors. Our tour lasted until lunch. 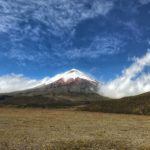 Johan genuinely enjoyed sharing his love for nature and never once rushed us through an experience.We even stopped for a while to watch a sloth on the move, which as you can imagine, was not the speediest of moves. While outside the National Park, keep a lookout for the area’s resident wildlife. Monkeys swing from trees all over. 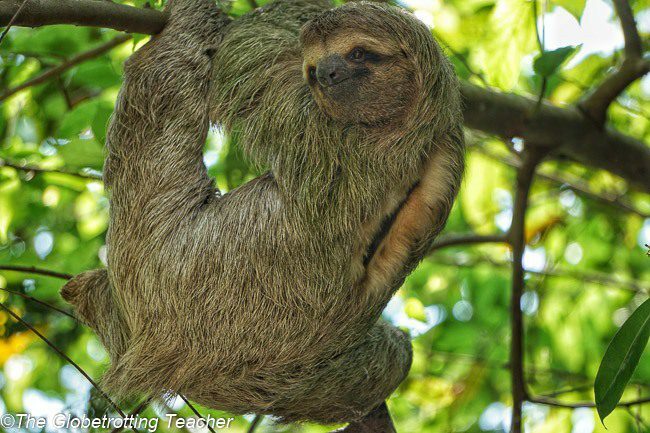 Sloths snuggled into roadside tree branches stop traffic, while colorful birds squawk overhead. 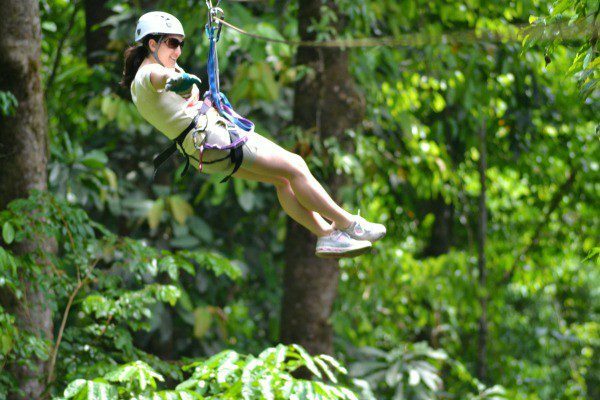 There are plenty of adventure activities to do in and around Manuel Antonio. 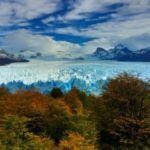 It was easy to arrange zip lining, ATV Tours, river rafting, kayaking, and paragliding excursions once we arrived. Zip lining is an absolute must. 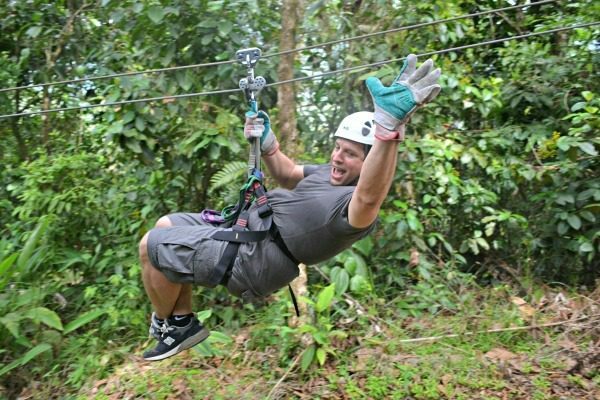 After doing canopy tours in other parts of Costa Rica, too, I’d recommend the Manuel Antonio area as the best place to fly over the treetops. We chose MidWorld Costa Rica. We flew nearly 7 stories up and over acres of primary growth tropical rain forest. It was a total thrill! 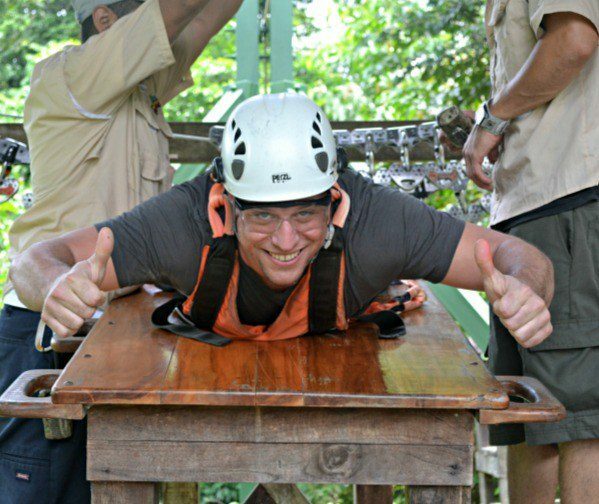 Flying “hands-free” over the rain forest! Mr. TGT having so much fun cruising through the sky! We rappelled off of platforms high up in the trees 60 feet down to the ground below. I had to turn backward, put my heels at the edge of the platform, lean all the way back, and drop! 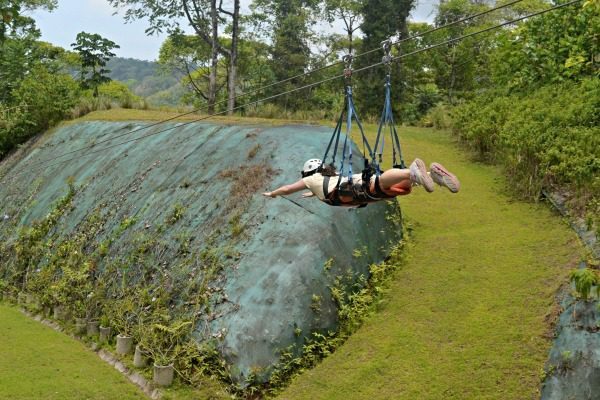 For our flying finale, we tried out the 3,000 foot Superman line at MidWorld Costa Rica. The Superman line puts you in an actual flying position! On the launching table, getting ready to fly like Superman! 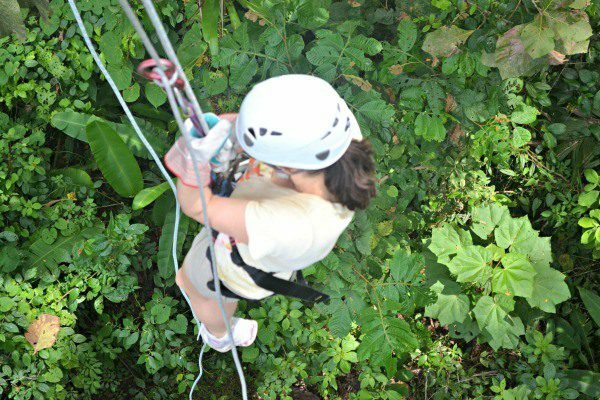 Your full body harness attaches to the cable from the back and you can fly with your arms out over the jungle. Heart-stopping doesn’t do this experience justice! After coming down from the trees, you can set off on ATVs. Spend the afternoon off-roading, river crossing, and speeding along dirt roads hidden deep within the rain forest. 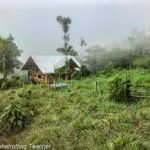 It was exhilarating to drive through the landscape, feeling the on and off drizzle hitting my skin, as we discovered waterfalls, flowers, and took in the tropical landscape all around. Costa Rica’s natural beauty never ceases to be breathtaking. 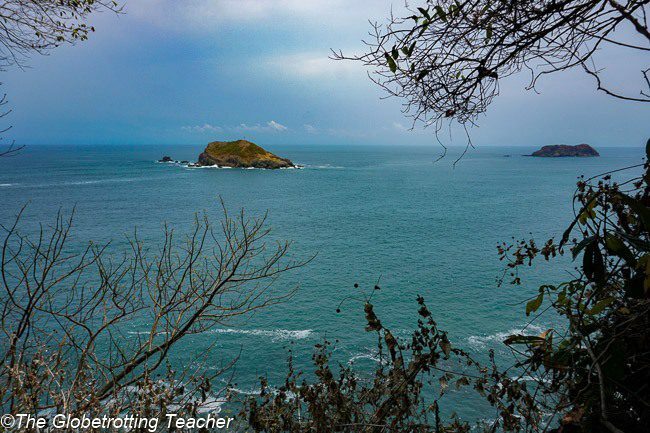 The Manuel Antonio area is the perfect mix of beaches, wildlife, and adventure. 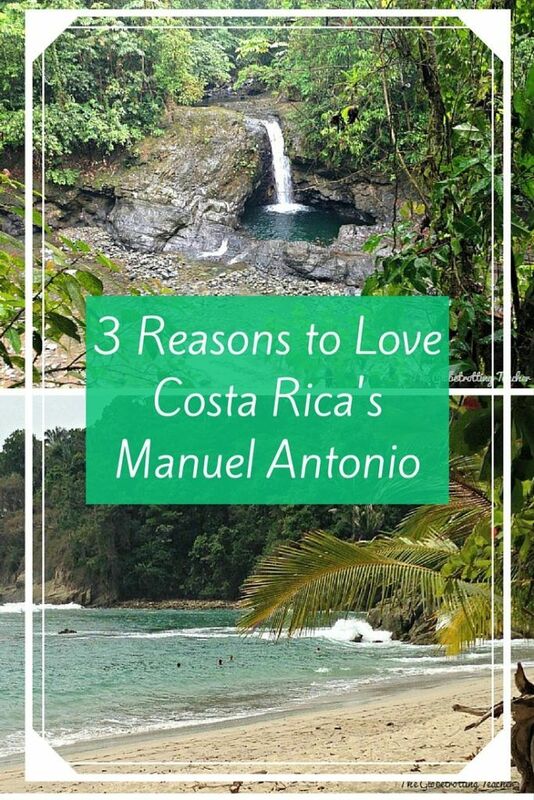 As you plan your Costa Rican itinerary, set aside a couple of days to explore Manuel Antonio. Would you like to visit Costa Rica? 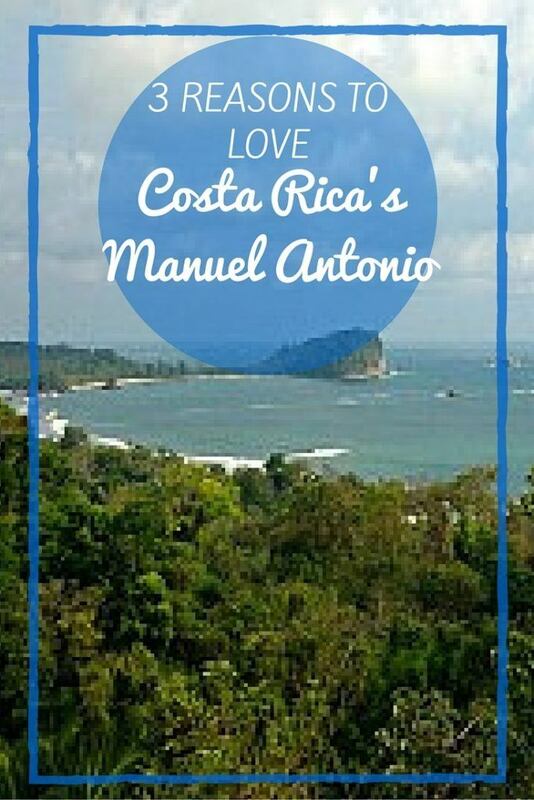 Have you visited Manuel Antonio? 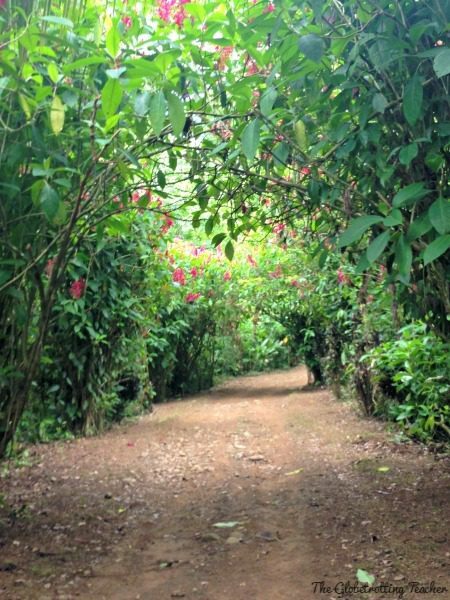 Want to Find a Hidden Treasure in the Costa Rican Rain Forest? Manuel Antonio is so beautiful, I love hiking there, the views are stunning and of course the wildlife is amazing. It is hard to get those monkeys, they are fast little guys aren’t they? I’ve been there quite a few times but never felt the need for a guide, there’s always groups around and it’s easy to spot the wildlife when everyone starts looking up haha. Where did you stay in Guanacaste? We used to live there and it is definitely not quiet! But there are some beaches and areas where it’s way more laidback and chill. Those monkeys are quick and nimble for sure, Samantha. We stayed right beside Tenorio Volcano National Park in Guanacaste. It was at a tucked away hotel for the more romantic part of our Costa Rican travels. We found our guide super helpful, but I know what you mean. There are certainly enough groups around for you to figure out which direction to look. 😉 We hope to make it back to Costa Rica soon! 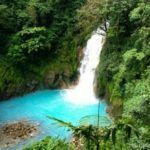 Costa Rica seems like it’s got it all, amazing beaches, tropical climate, adventures, and awesome wildlife! I want to see those monkeys! Thanks for reading, Megan. Costa Rica is fantastic. The wildlife is such a thrill to see! Just keep an eye out and make sure those monkeys don’t steal your lunch! 😉 Hope you can visit soon. 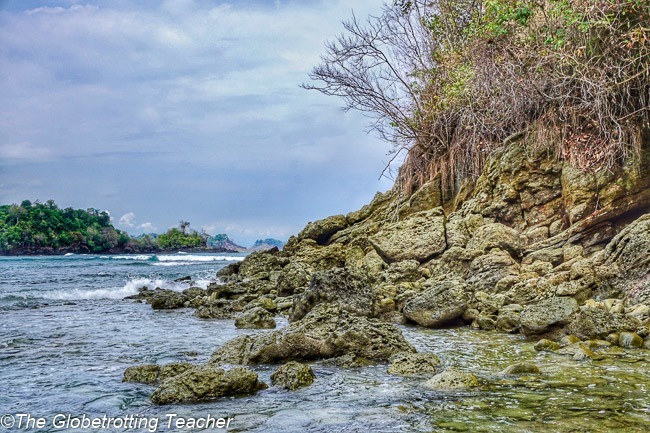 Beautiful beaches, heaps of animals, and lots of adventure….Costa Rica sounds like just the place for me! 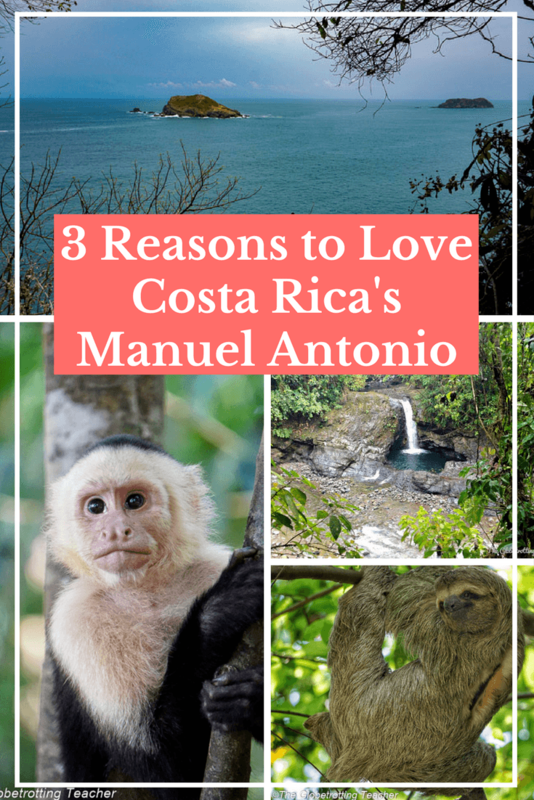 I’ve had a few friends visit the Manuel Antonio area and said nothing but amazing things. Manuel Antonio is a great place to start, Stephanie. It’s a really gorgeous part of the country. Hope you can make it soon!